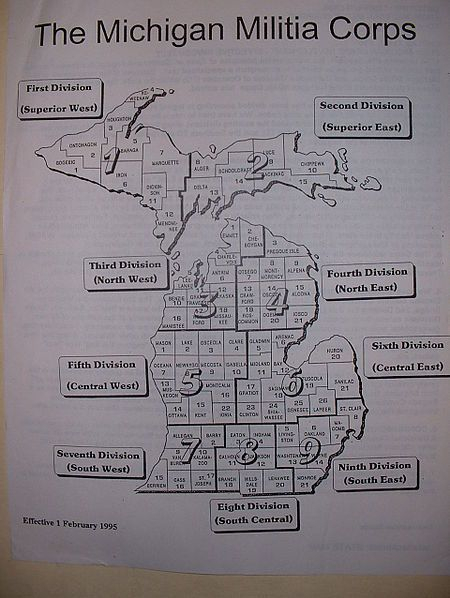 The Southern Michigan Regional Militia covers the 7th, 8th, and 9th divisions of the M.M.C.W. A well-armed citizenry is the best form of Homeland Security and can better deter crime, invasion, terrorism, and tyranny. The intention of this website is to inform, promote and facilitate the development and training of the militia. Everyone is welcome, regardless of race, creed, color, religion or political affiliation, provided you do not wish to bring harm to our country or people. If you are a citizen of the Great State of Michigan (or have declared your intent to become such), who is capable of bearing arms, or supports the right to do so, then YOU ARE the MICHIGAN MILITIA!!!! The unorganized militia consists of all other able-bodied citizens of this state and all other able-bodied citizens who are residents of this state who have or shall have declared their intention to become citizens of the United States, who shall be age 17 or over and not more than age 60, and shall be subject to state military duty as provided in this act.